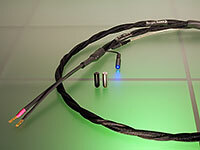 NEW ITEM!VH Audio CHeLA Speaker cable (in bulk), now available with pure, solid OCC Copper conductors! The CHeLA OCC speaker cable is made of 48 individually insulated 24 AWG SOLID OCC (Ohno Continuous Cast) copper conductors that are insulated with VH Audio's AirLok� dielectric. VH Audio's AirLok� dielectric is a proprietary form of foamed/cellular Fluoropolymer that has a dielectric constant of LESS than 1.5 and an extremely low dielectric absorption. The 48 OCC copper conductors are braided into VH Audio's Counter Helical Litz Array TM geometry (C.He.L.A.) around a core containing strands of unbleached cotton. This special self-shielding speaker cable geometry results in very low inductance (.011 uH*), reasonable capacitance (230 pF*), and low DCR (1.35 milliohms per foot*). Additionally, the CHeLA geometry results in more symmetrical field interaction between strands vs. conventional braided designs. 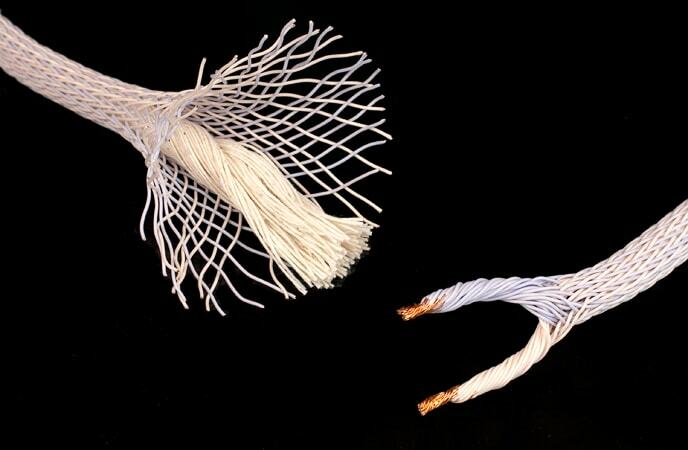 Aggregate AWG for each grouping of 24 conductors is 11 AWG, and approximate cable diameter is 3/4"
Preparing the bulk cable for termination is easy, but will take some effort to debraid the last several inches, to form into +/- pigtails. To terminate into your favorite connector, the last 6-8 inches of each end of the cable must be de-braided, separated into "positive" and "negative" legs (blue and white) and trimmed to equal lengths. Then strip about 3/4" of insulation, twist into pigtails, and trim once again before terminating into your favorite connectors. The entire project should take about two hours. Roger Gordon's Rocky Mountain Audio Fest report noted the Rhino Acoustics/ Vacuum State setup "was easily the best sound that I had heard at the show". The OFHC version of the CHeLA speaker cabling was used when Vacuum State's amps were connected. Limited quantity is available, and pricing is subject to change, as copper prices continue to skyrocket!